It is too simplistic to claim that the UK has a single relationship with the EU. Yet the regional dimension of UK/EU relations has received relatively little attention in the public debate around the implications of ‘Brexit’, despite the fact there are significant differences in the composition of local economies across the UK’s regions and nations, which give rise to longstanding geographical inequalities in economic outcomes across the UK. These differences manifest, for instance, in different trade patterns across the UK’s regions and nations, including trade with the EU. As such, an examination of the different trade relationships that different UK regions and nations have with the EU helps us to consider both how the UK will be affected by Brexit, and who will be most affected. Unfortunately, our ability to understand this is hampered by a severe data shortage: regional trade data is only available for trade in goods (principally manufactured products and commodities). Data on regional differences in trade in services (such as financial services, business and legal services) with the EU would clearly be required to create a more detailed picture. Nevertheless, even this partial picture reveals a great deal about the subnational variations in UK/EU trade relations. The analysis in this post is based on HMRC regional trade statistics (with per capita values calculated using ONS population estimates). The full analysis is available in a new SPERI British Political Economy Brief co-authored by Tom Hunt, Scott Lavery, Chris Kirkland and me, supported by the ESRC’s UK in a Changing Europe programme. 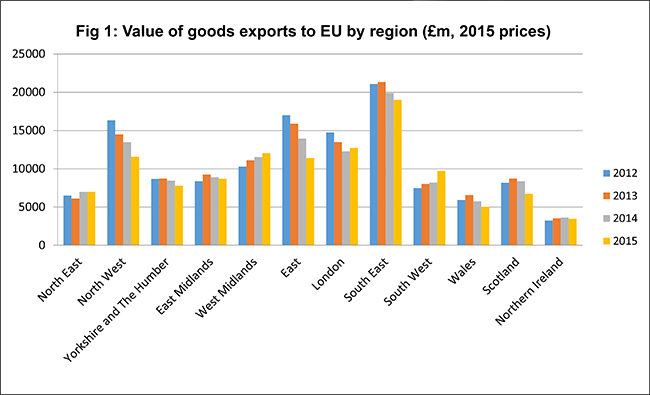 Figure 1 shows that the regions of the South of England export more goods in absolute terms to the EU than those in the North of England and the devolved nations. 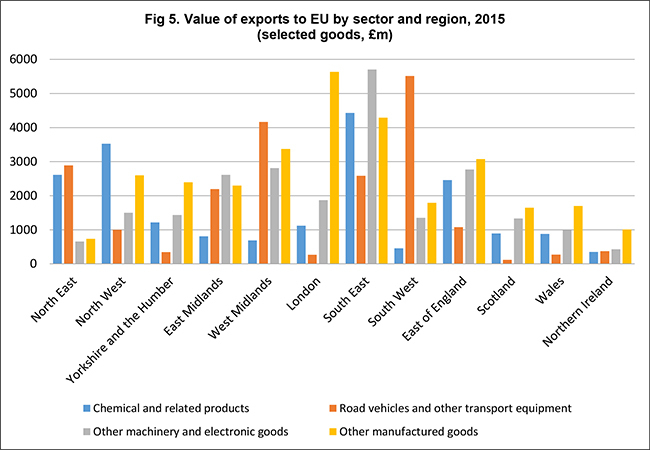 The main exceptions are the North West, which exports goods to the EU at comparable levels to the Southern regions (including the East of England), and the South West, which exports relatively few goods to the EU. The chart below (Figure 2) shows how EU goods trade contrasts with non-EU trade, on a regional basis – and demonstrates some striking results. For instance, the North East is far more dependent in terms of goods exports on the EU than on the rest of the world, despite exporting relatively few goods to the EU compared to other regions. The same applies to the South West and Northern Ireland. 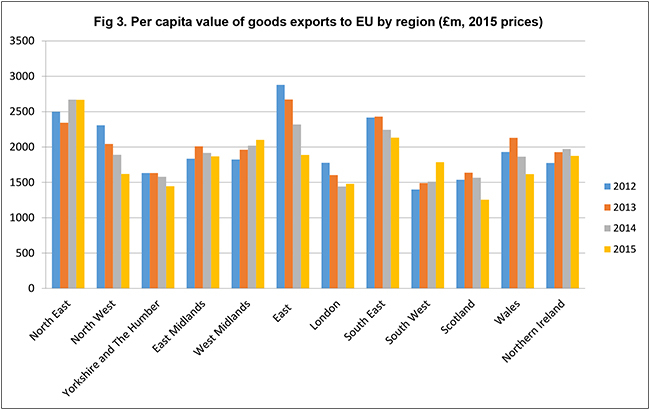 London, Scotland and Wales are less dependent in terms of goods exports on the EU than other regions, and Yorkshire is more dependent than most, despite exporting fewer goods in total to the EU than, for instance, the Midlands regions. The next chart demonstrates, furthermore, that the North East now actually exports more goods to the EU than any other region, measured per head of population. Wales also exports significantly more goods on this measure than suggested by the results for total value of goods exports. The East of England was ahead on this measure in 2012, but the per capita value of the region’s goods exports to the EU has declined significantly in the last few years. But what does the regional picture look like once the balance between exports and imports is taken into account? Figure 4 shows that the North East is the only English region to have consistently had a substantive goods trade surplus with the EU in recent years. Wales and Scotland both also have a goods trade surplus with the EU. The North West and Yorkshire have only small goods trade deficits with the EU, which contrasts with the very significant goods trade deficits for the East of England, London, and particularly the South East. Of course, it should be reiterated at this point that we have data only for trade in goods. We know that, overall, the UK has a surplus in services trade with the EU of over £35 billion. Given the concentration of high-value (and more tradeable) services such as financial services, and business and legal services, in London and the South East, we should be careful not to assume from data on trade in goods alone that these regions would be relatively unaffected by any restrictions on trade with the EU. Breaking down the data on goods trade by sector is also revealing. 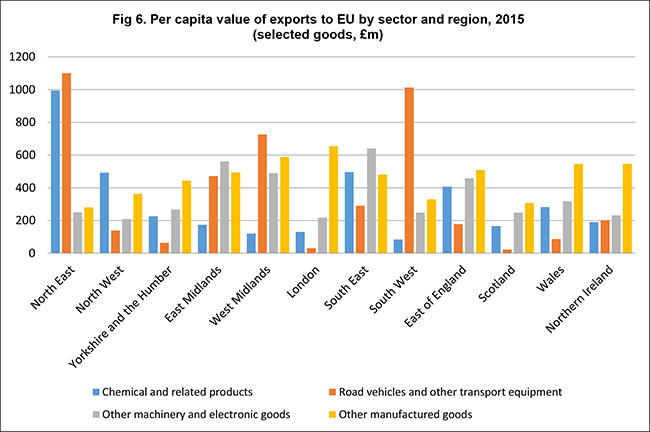 The next two charts (Figures 5 and 6) show regional differences in, respectively, the value of goods exported to the EU in 2015, and the per capita value, disaggregated by the most important sectors. It should be noted that I have disaggregated and conjoined some of the sectoral categories in the HMRC data, to enable a meaningful comparison. It is clear that some regions, notably the North East, South West and, to a lesser extent, the West Midlands rely heavily on exports of vehicles and transport equipment. Similarly, some regions rely heavily on exports of chemicals (including pharmaceuticals, pesticides, fertilisers, paints and plastics); this applies, again, to the North East, but also, to a lesser extent, the North West. That chemicals and cars are among the products with the highest tariffs for imports into the EU means these regions will be very negatively affected, other things being equal, were imports from the UK to be treated in line with those from other non-EU countries in the event of Brexit, even if only in the short term. It is regrettable that the regional dimension of the UK/EU relationship has received relatively little attention in the public debate around the implications of ‘Brexit’, and even more so that the data available on the trade relationships between UK regions and the EU is incomplete. Yet we can conclude that the Southern English regions and the North West export most goods in absolute terms to the EU, but paradoxically those regions that tend to export fewer goods are more reliant on the EU insofar as EU countries are the destination of a greater proportion of their goods exports. 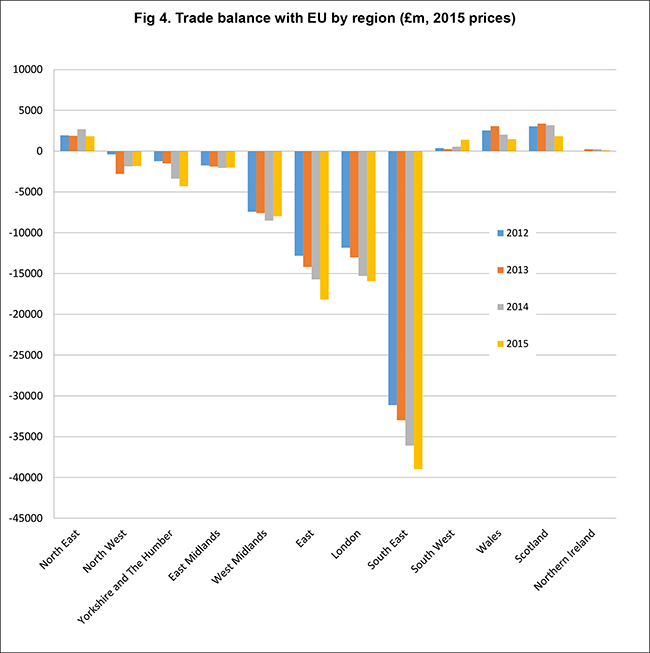 In particular, Northern Ireland (the UK’s poorest region), the North East (England’s poorest region) and the South West (Southern England’s poorest region) appear to the most dependent on the ability of the UK to trade in goods with relatively few restrictions with other EU countries. Of course, the fact that these regions are already among the UK’s most disadvantaged suggests that the economic status quo does not work in their favour. However, it is highly uncertain that a greater imperative for the UK overall to develop trade relationships with the rest of the world, if trade with Europe becomes more restrictive, is a path to greater prosperity for these regions.